This book is the culmination of over thirty years researching the history, production, and identification of hollow lead civilian toys. It carefully documents the civilian toy figures produced by over 75 companies between 1900 and 1966. A number of Britains civilian items have also been included for comparison. Easy to use, the book is organized by themes, ranging from Art Work to Zoo figures, with Christmas, farm, garden, and many more in between. Illustrated with over 1,500 full color photos, it includes current pricing, and provides a history of the toys, as well as the a social history. Examples from Argentina, France, Germany, Japan, and the U.S.A. join the many figures produced in England. 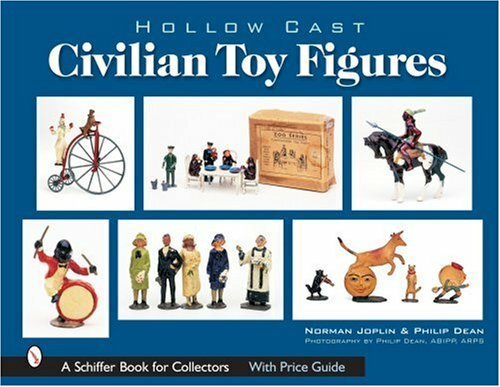 The most significant book on civilian hollow cast figures since The Great Book of Hollow-Cast Figures, published by Norman Joplin in 1993, this new book, combining the knowledge and skill of two renowned experts, is sure to be the "new testament" for collectors and toy aficionados around the world. Norman Joplin is author of two previous Schiffer books on toy figures and is editor of Old Toy Soldier Magazine. Philip Dean is a professional photographer and an avid collector of civilian lead figures. Norman lives in Wisconsin and Philip lives on the south coast of England.